I think its going to get quiet around, it always does when the Prog is good, who needs to here folks just saying week in week out. This was great, that was great etc etc. Well when the Progs this good we really need to be shouting it from the roof tops. As loud and proud as we can. We are more than capable of whittering and moaning like a Facebook mob whenever we have a beef and I don't exclude myself from that at all, so when Tharg proves beyond a doubt why this comic is called the Galaxy's Greatest we should be just as vocal and not drift from coming here and showering praise. If we've learnt nothing this week its that we must take things for granted. The Prog is once again superb, just superb. Dredd is three fantastic 2 page scenes each offering something different, each moving the whole masterfully forward. Fiends is a glorious balancing art of action and tension and then a lovely line at the end to throw the night world this story takes us to open. Skip Tracer is basically since last time the new story I enjoy at these times. Its almost unrecognisable, has given me more reasons to care than then a fantastic 'dreamscape' to fire my imagination. Kingdom is just Kingdom and that's classic 2000ad at its best. The entire Prog is a masterclass in art. The Prog as a whole is a sublime mix of different and familiar and when its this good we must never get tired of saying so. Cover by Cliff Robinson with Dylan Teague colours. Really good prog! Loving it. Anyone wanna tell me who Clone Of War Marshall Kazan is and why he is important? Rob Williams on Dredd in two words. Anatoli Kazan is the crippled clone son of War Marshal Kazan. He was originally a cadet of East Meg Two and was a thorn in Judge Dredd's side, attacking him through his niece Vienna. He later defected to Mega-City One where he offered to help Defence Division. Dredd was highly suspicious of Kazan's true motives and persuaded the Chief Judge not to trust him, but the Council of Five overruled them and voted to employ Kazan (under strict supervision). Kazan's advice and inside information led to Mega-City One's regime change action in Ciudad Barranquilla, in order to prevent a Sov attempt to do the same; Kazan was drawn looking sinister at the end of the story, suggesting a deeper agenda to his actions. I'm with Colin on this one, more of the same superb quality stories and art. With a lovely Cliff Robinson cover too. 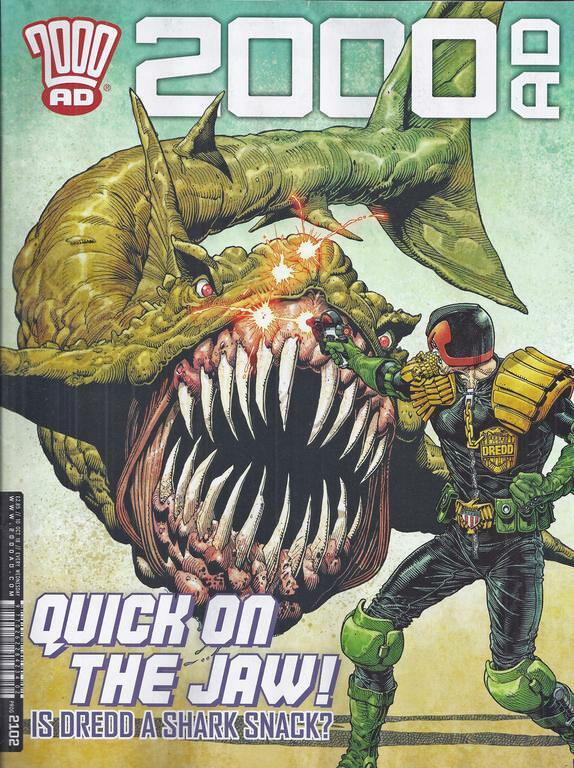 TMO is spoiling us and long may it continue..
Oh and the other thing I forgot, aside from that lovely cover - how angry does that duneshark look - is Thrills of the Future - MORE ZAUCER OF ZILK - wayhey!!!! I must say I'm pleased to see the Kazan clone appear- that character, from memory, was written by Gordon Rennie back in the day when Gordon was writing a lot of Dredd. Once Gordon stepped away the character wasn't seen (happy to be corrected on this if I'm wrong) until now where it looks like Rob Williams is moving a long bubbling plot into high gear. The rest of the prog is just firing on all cylinders right now. Al Ewing picked up that thread in the wake of Chaos Day (prog 1803), with Dredd rightly demanding what good Kazan was as intelligence given what had just happened to the city. It's always preferrable when these things are picked up on by later writers and given closure, rather than just abruptly dropped. Yes the Prog is great at the moment. Especially Dredd. I just love the intrigue and the way previously sown seeds are now coming to the fore. Brink is just the best new thrill this side of Lawless. Skip Tracer continues to be way better than series one and has potential to be a”good” thrill. Certainly on a level with many from the past. FOTEF and Kingdom continue to deliver what they do best. Skip Tracer is definitely better than it used to be. Prog 2102 continues to be stellar. Dredd & Brink are A*, although I’m sure some would find Brink too talky.